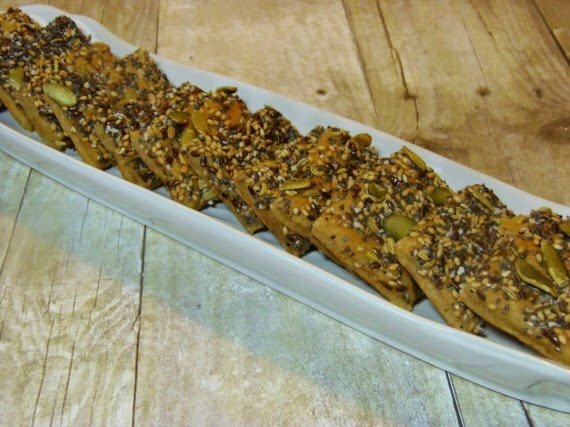 It’s ironic that I’m posting this recipe for Football French Bread the day after our team, the Chicago Bears lost (with the home field advantage) to our arch rivals, the Green Bay Packers. UGH! We’ll never hear the end of it, you can be sure…but never mind all that! That’s hardly important! Our host for this month’s challenge is Ilva from Lucullian Delights, and I can’t tell you how thrilled I am that she chose this wonderful recipe. It is simply the best tasting bread I think I’ve ever made, and that’s saying a lot because I really LOVE to bake bread! 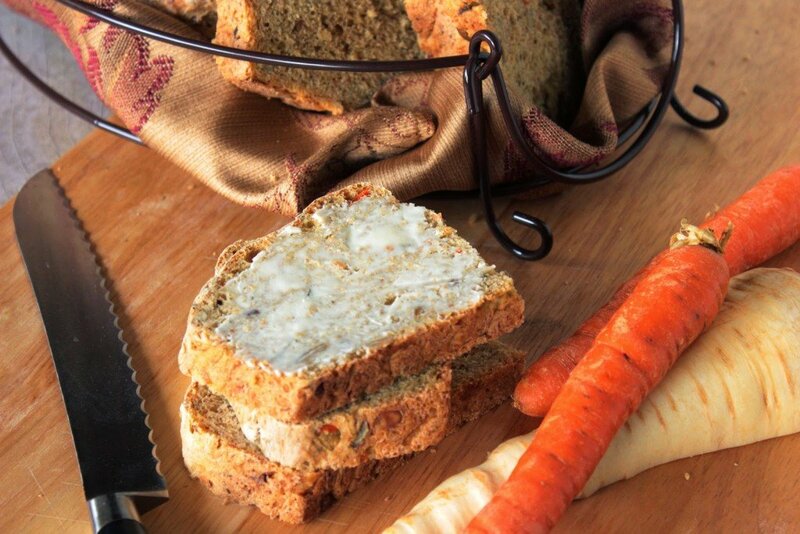 This French bread recipe was originally published in a cookery book in 1660 by Robert May. It’s an easy to follow and simple recipe that requires nothing more than a bowl, spoon, whisk and some elbow grease for kneading. And, with straightforward ingredients, it’s likely you’ll be able to make this bread at a moments notice with ingredients you already have on hand in your kitchen. 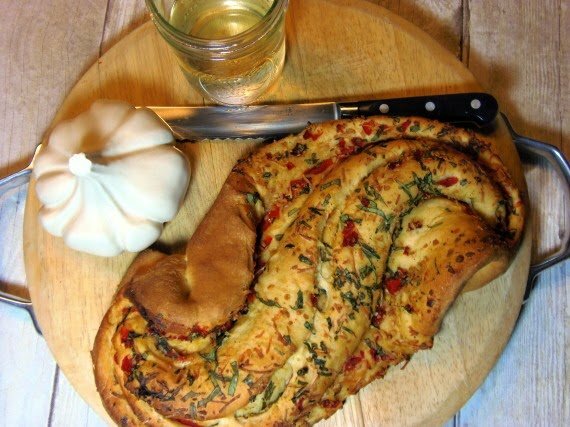 From there, you can get as creative as you want with the shaping of this dough. Like I mentioned earlier, I shaped mine for my football loving family, but the design possibilities are only limited by your imagination. To see all the other creative Robert May’s 1660 loaves from this baking group, make sure you click on the links at the end of this post. You’ll be amazed, and inspired, to get baking ASAP. I promise. -Combine the water and milk in a small bowl. Microwave on low power until warm (110-115 degrees). 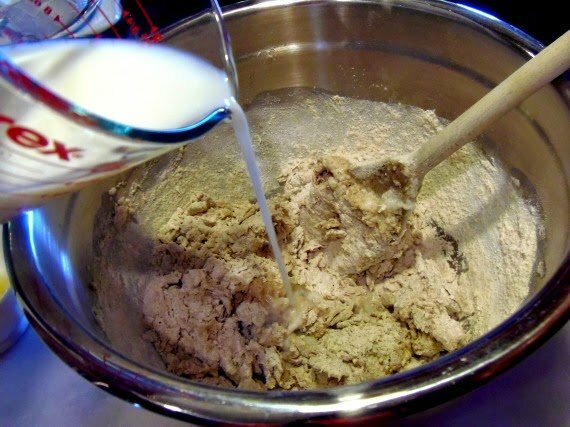 -Sprinkle the yeast over the water/milk mixture and stir to completely dissolve. -Stir in the maple syrup into the yeast mixture and allow it to sit and get foamy (about 5 minutes). -Meanwhile, add the egg whites into a medium size bowl and whisk by hand until the egg whites get frothy and soft peaks form. Set aside. 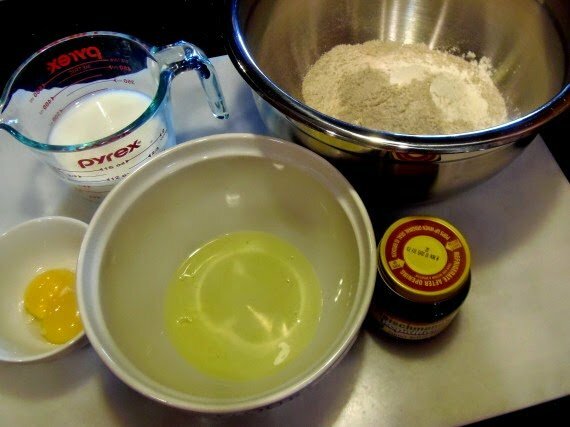 -In a large bowl, stir together the all-purpose flour, whole wheat flour and salt. 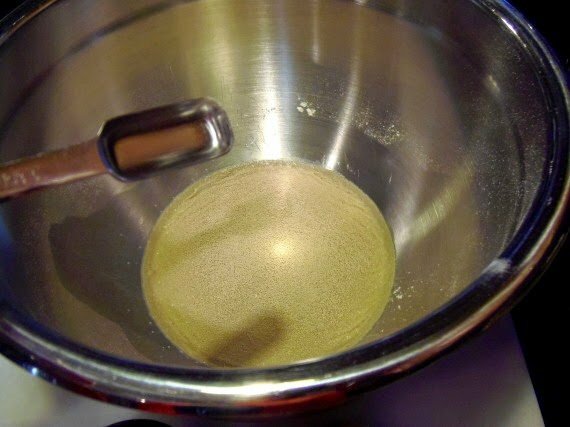 -Use a wooden spoon and stir in 1/2 the yeast/milk mixture and all the frothy egg whites *Note – make sure you whisk them again right before you add them into the flour mixture. 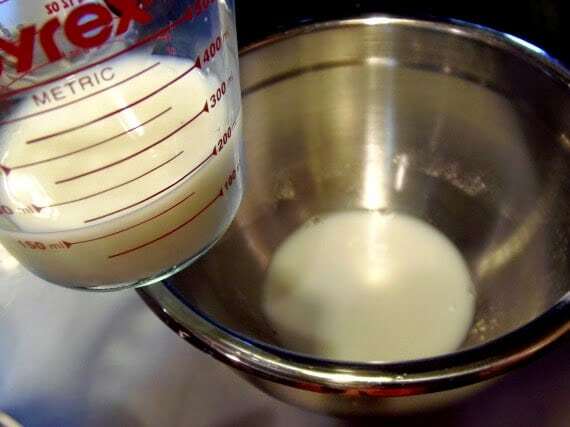 -Add in as much of the remaining yeast/milk mixture as needed until the dough comes together to form a ball *Note – You may have some liquid leftover. It isn’t always necessary to use all of it. 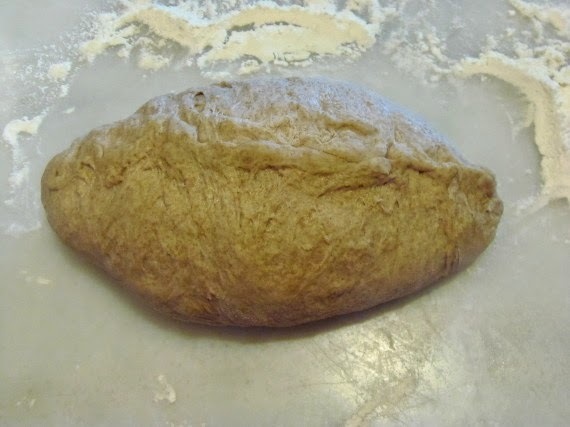 -Turn the dough out onto a lightly floured surface and hand knead, adding a little additional flour if needed until the dough is smooth and slightly tacky. 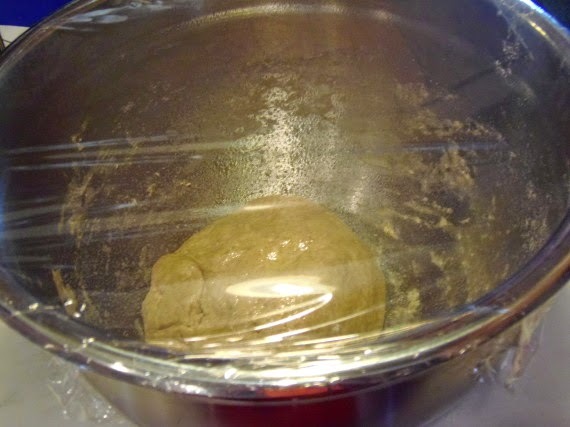 -Place the dough into a lightly oiled bowl, cover with plastic wrap and allow to rise in a warm, draft free place until doubled in size (approximately 1 hour). 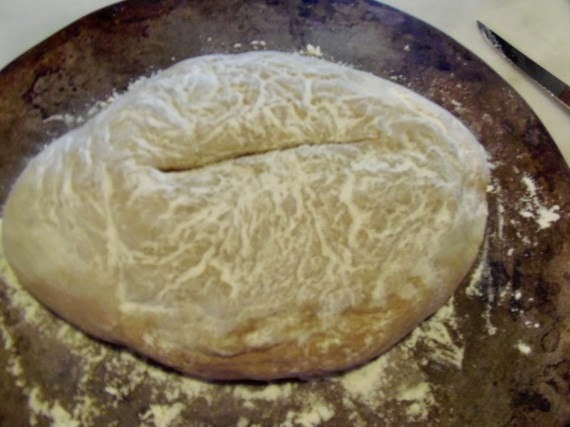 -Turn the risen dough out onto a lightly floured surface and flatten it into somewhat of a disc shape. -Bring the sides of the dough up and into the center of the disc and use your fingers to pinch the seams together. -Use your hands and fingers to gently but firmly push and prod the dough into the general shape of a football. 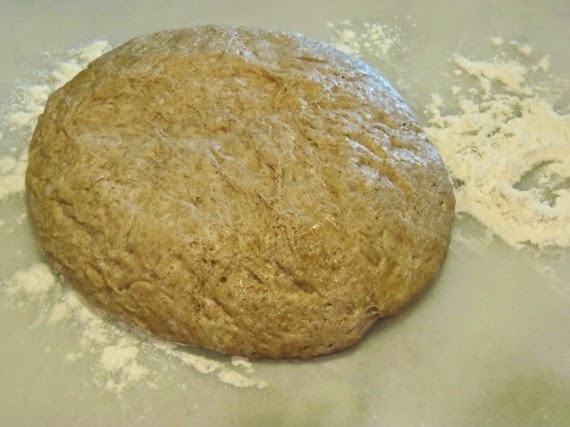 -Place the dough, seam side down on a lightly floured pizza stone or baking sheet. -Re-shape the dough as needed. -Allow the bread to rest and rise again until doubled (about 45 minutes). -Preheat oven to 450 degrees. -Dust the football with an additional coating of flour. -Use a sharp paring knife to carefully cut the laces and lines in the dough to resemble a football. -Toss 4 or 5 ice cubes in the bottom of the preheated oven (this makes steam) and quickly slide the bread into the oven. 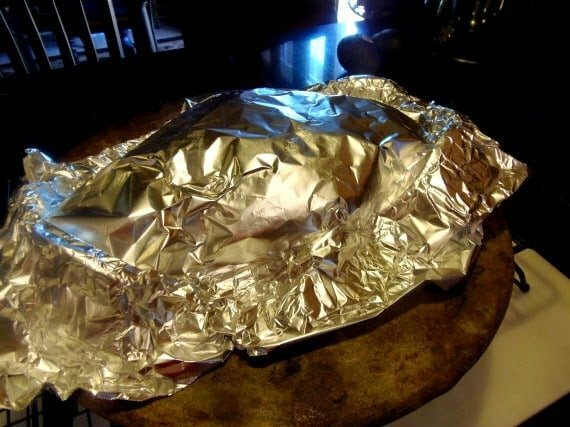 -Bake for 15 minutes and then cover the loaf with foil and continue baking and an additional 15 minutes or until the bread sounds hallow when tapped. -Cool on a wire rack. 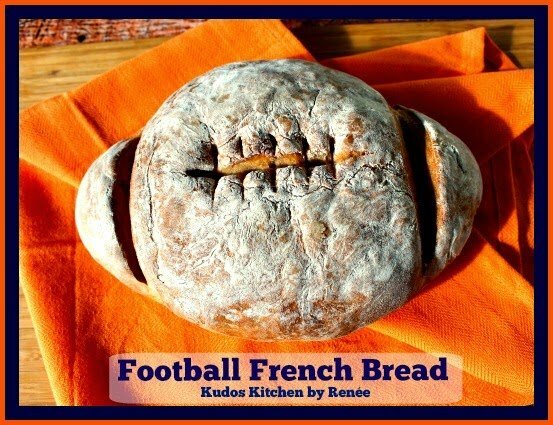 Here are a few step-by-step photos I took during the process of making this Football French Bread to help you better understand the process. However, should you have any questions that aren’t answered by the photos, please leave them for me in the comment section. I’ll be happy to answer any and all questions just as quickly as possible. Dissolve the yeast in half the warm water and milk mixture. Stir in the maple syrup and allow the mixture to get frothy. In a large bowl, stir together the flours and salt. 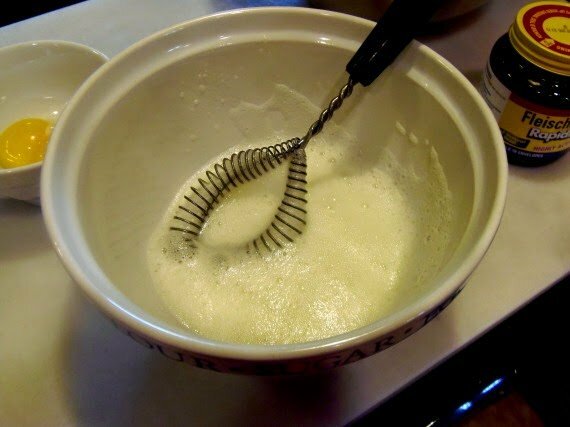 In a medium bowl, briskly whisk the egg whites until soft peaks form. 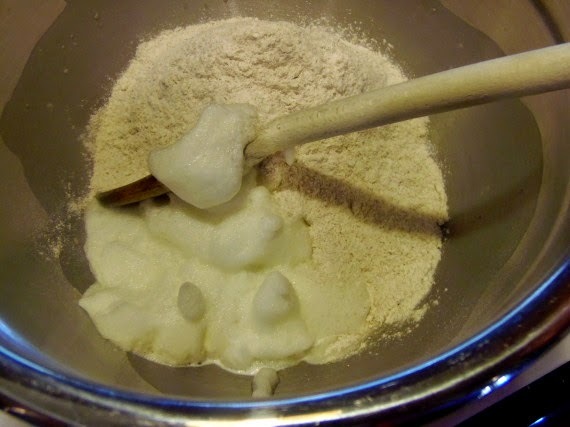 Use a wooden spoon to stir the frothy egg whites into the flour mixture and stir in the yeast mixture. Stir in enough of the remaining milk mixture to form a soft, sticky dough. Turn the dough out onto a lightly floured surface and knead by hand until the dough is smooth and slightly tacky. Place the dough into an oiled bowl and allow it to rise for 1 hour or until doubled in size. Turn the dough out onto a lightly floured surface and shape the dough into a football by pulling and pinching. 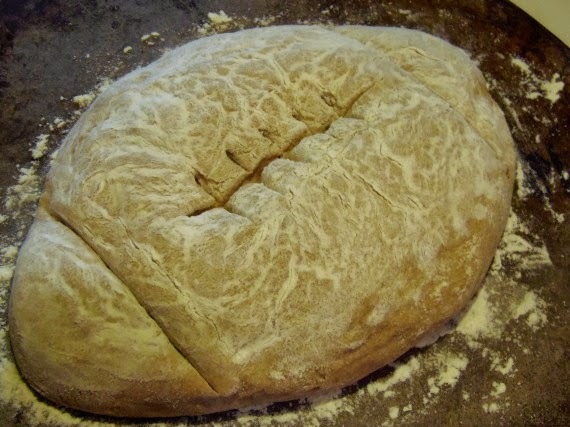 Transfer the loaf, seam side down, onto a floured baking sheet or a pizza stone. 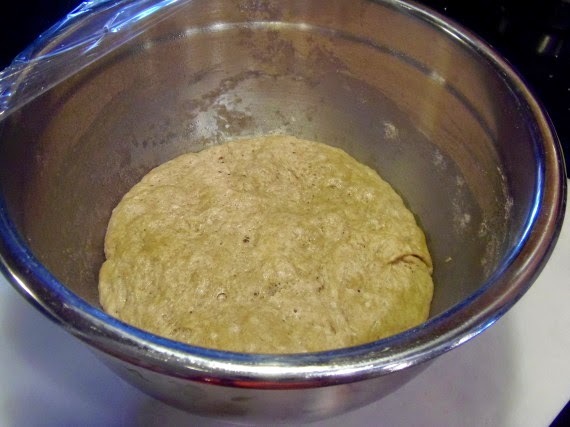 Allow the dough to rise again until double (about 45 minutes). 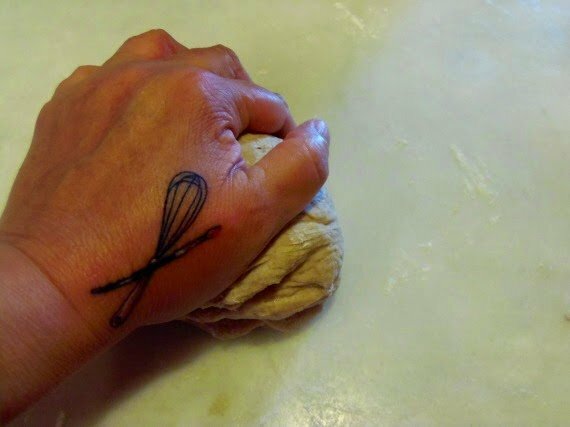 Once risen, dust the dough lightly with flour and use a paring knife to slice the laces, and the football end markings, into the dough. Preheat the oven and toss some ice cube into the bottom to cause steam. Slide the baking sheet into the oven and bake at 450 degrees for 15 minutes uncovered, and then 15 minutes covered until the bread sounds hallow when tapped. The texture of this bread is outstanding! The interior crumb is relatively soft and chewy, but it still has some bite to it. And the crust has a satisfying crunch and flake that the ice cubes and the oven steam help to form to seal in all its goodness and flavor. It’s bakery bread at it’s finest… only you made it yourself! Take a bow…you deserve it! Remember earlier when I said you simply must visit the other Bread Baking Babes to see their interpretations of this Robert May’s historical 1660 French bread? Well here are their links. I truly encourage you to go and visit. I promise…you will not be disappointed and I assure you, you’ll be inspired by all their wonderful and creative loaves. So which Babe is the hosting kitchen this month? 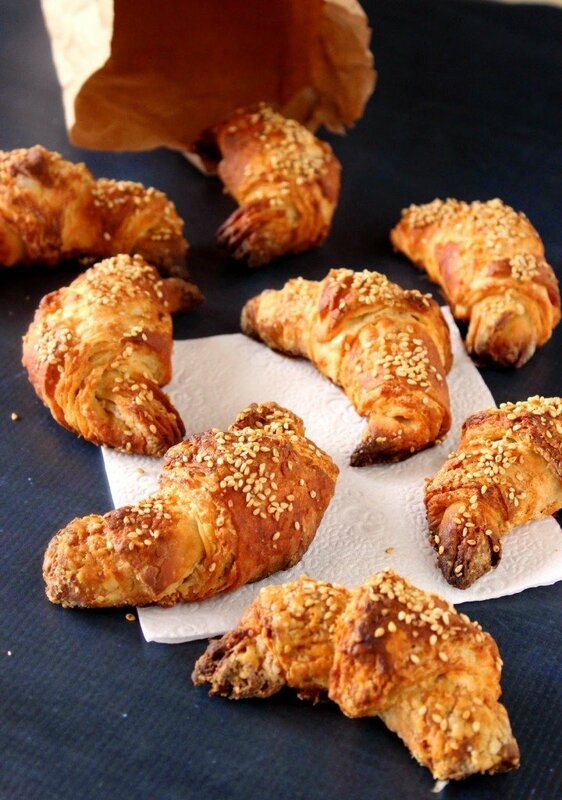 That would be Ilva at Lucullian Delights, if you’d like to join in, simply make Robert May’s French Bread (and your own decorative dough) – and then send Ilva your link (info in her announcement post). Submissions are due by September 28th. 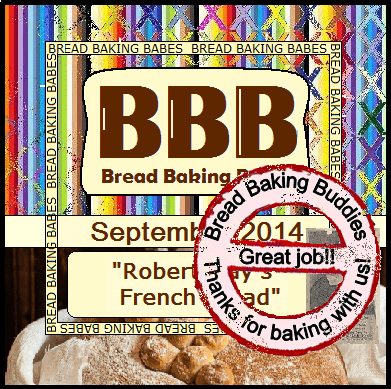 Once you’ve posted, you’ll receive a Buddy badge for baking along. I hope you’ll join us this month! If you’re curious about the other breads I’ve/we’ve made over the past months for the Bread Baking Babes and Friends, please take a gander at these. They’re some of my favorites, and I have a special place in my heart for each one. Thank you so much for visiting me in my Kudos Kitchen. I sincerely hope you’ve enjoy your stay, and will visit again soon. I'm a baseball fan, myself. But this is a perfect example of how no matter your love or hate of any sport, the food that goes with it is always great. This is truly one of the most creative things I've seen in a long time. LOVE IT. 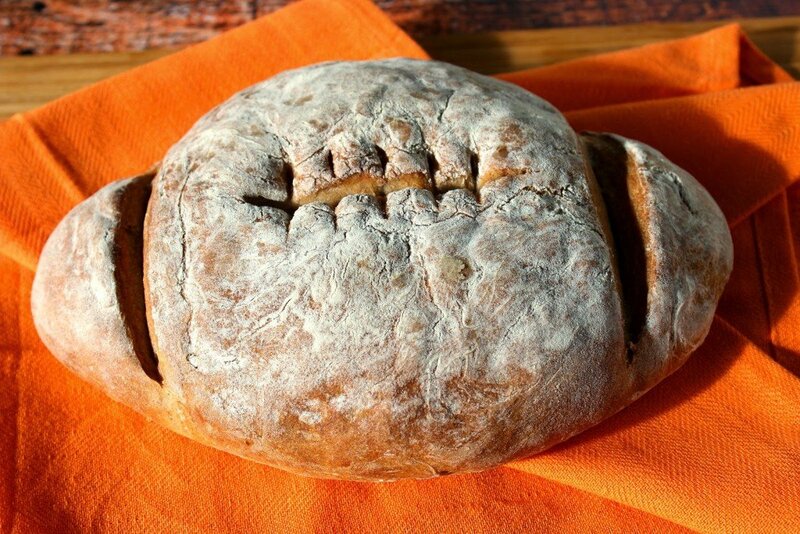 I can say with total confidence that I have never before seen a football shaped loaf of bread. Very creative! 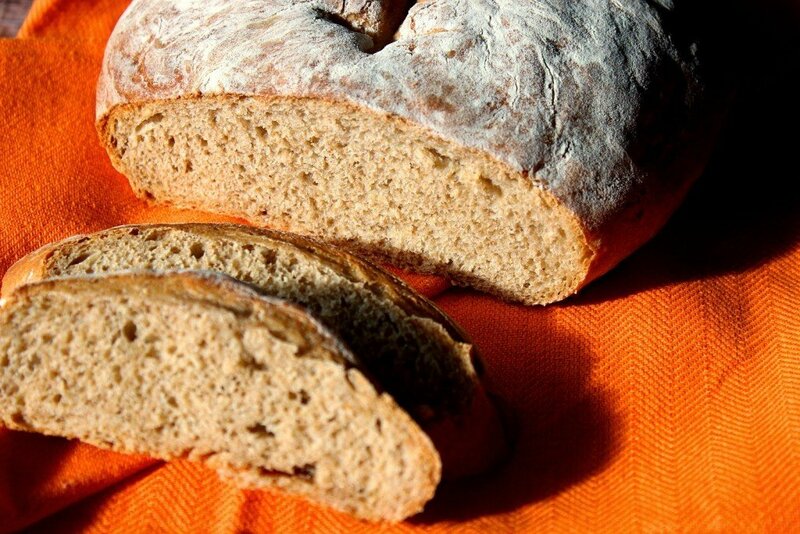 Isn't it crazy how such a simple bread, with so few ingredients, can be so tasty? And I also love the tat-shot (so cute). I love the whimsy of the football shape and BTW I'm loving the tattoo! I love this! The bread looks perfect and I love that you included step by step photos! How fun is that? My guys would flip over this! How perfect for an evening of football!! Making this for the next game! Gosh I commented on your facebook post of the bread but not here! 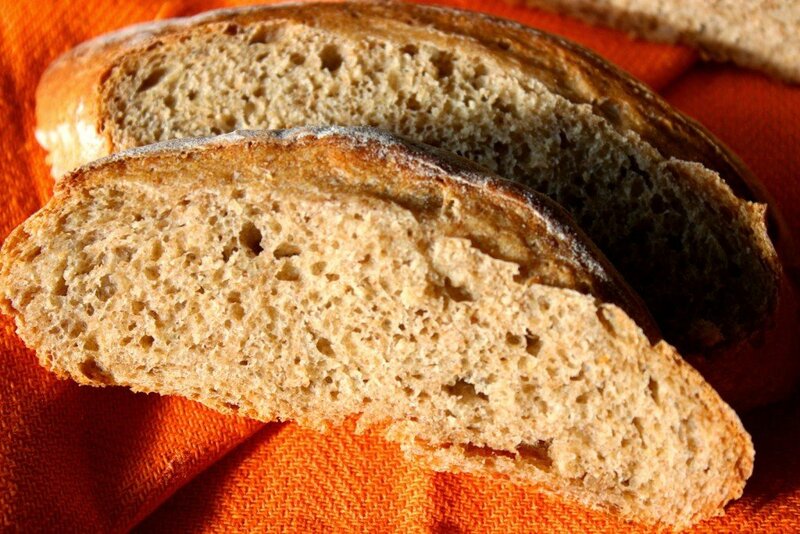 I love how you took such an old bread and turned it into something completely contemporary! Bread really is timeless. And your bread is perfect! Look at that crumb! 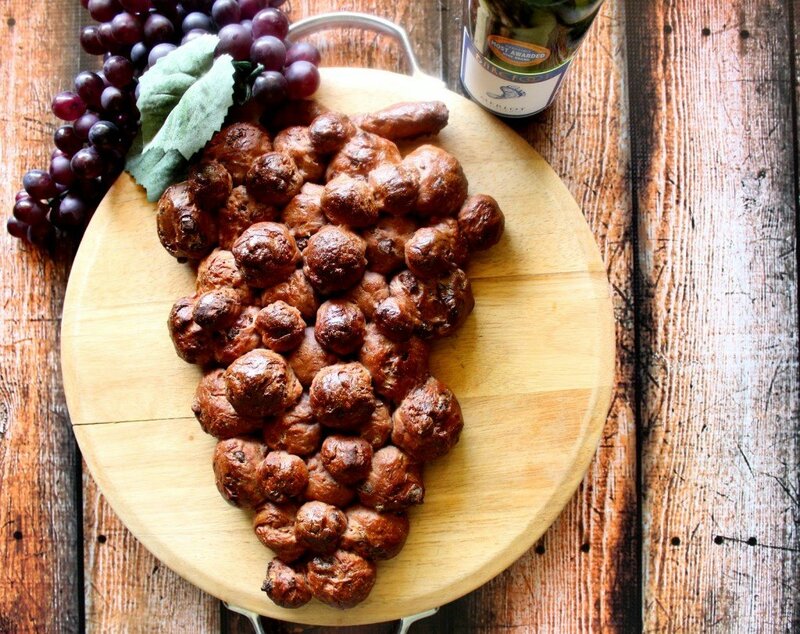 I love seeing what you do to BBB breads! Love the shape, it's fun! The maple syrup in the bread makes it sound intriguing. HOW AWESOME IS THIS?! That bread, that crumb! I love baking bread, love the scent of yeast, and mostly – Love kneading dough. Will try this one for sure!! So creative!!! 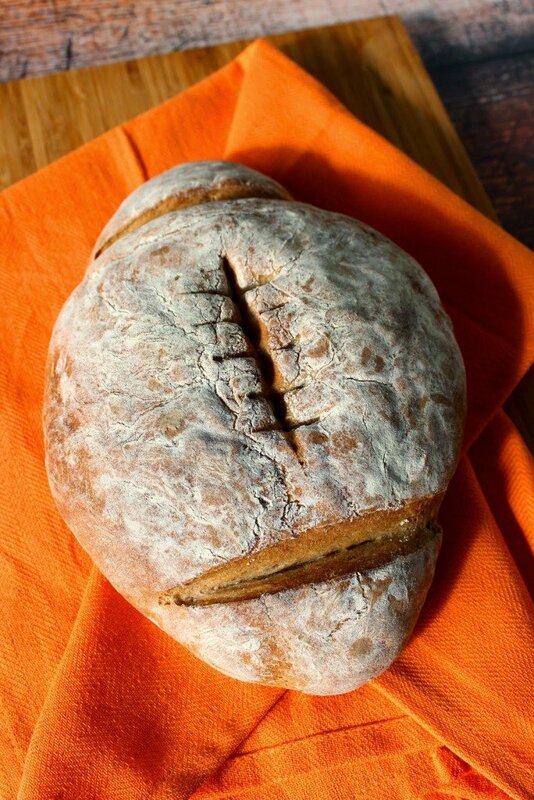 I love baking bread and, though I don't watch football, I will be taking this to my next tailgating event. You don't have to watch the game to be a great tailgater. 🙂 Am I right?